I love creating wedding centerpieces. 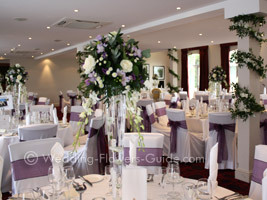 They allow you to show your individual style and can provide that 'wow' factor to a reception venue. To choose the perfect wedding centerpieces you can make your choice based on your wedding theme, color, style of venue and budget. Here I've put together some ideas from real-world brides that I've worked with recently. I hope they help you decide on your centerpiece arrangements for your special day. 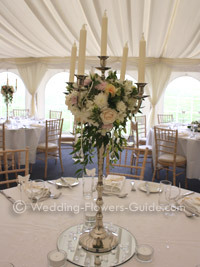 Candelabras look elegant and are a beautiful way to transform a reception venue with a high ceiling. They also work well in wedding tents and marquees. 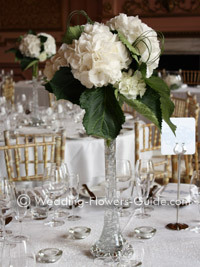 Hydrangeas have also become a popular flower for adding visual impact to wedding tables. You can see an example in the photo below. 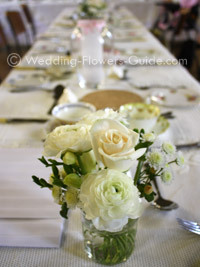 Another idea is to use a thin tall vase with a cascading flower arrangement on top of it. In the photo below you can see how I've created this type of arrangement. Click here for more ideas on creating tall centerpieces. A classic low centrepiece is a posy arrangement of flowers that co-ordinate with the bride's bouquet such as roses and tulips. For a modern look that is a bit different you could take a collection of different sized vases and use them as the basis for a centerpiece. Fill them to different heights with water and place various types of flowers in them. Colour co-ordinate them by using coloured granules in the bottom of the vases. 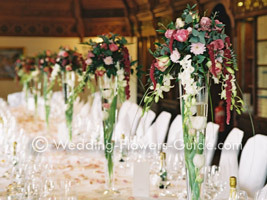 Below is a photo showing this idea with cymbidium orchids. 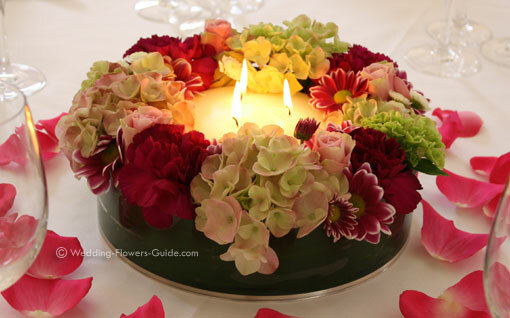 For more pictures and ideas for low centerpieces, click here. 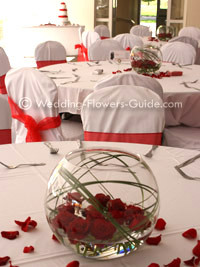 Wedding Centerpieces are a great way to establish the theme of your wedding. Vintage theme weddings are popular at the moment. You can create centerpieces for this theme by using traditional flowers such as roses and ranunculus placed in mason jars or jam jars (as seen in the photo below). If you are having a tropical or beach theme, you can choose exotic flowers such as anthuriums or heliconia and use decorations such as seashells. If you want a romantic feel you can use candles with your wedding centerpieces or have heart-shaped centerpieces. Alternatively if you want to keep everything simple, choose some elegant flowers such as calla lilies that look great with the minimum decoration. The main thing on people's mind at a wedding reception is chatting to old friends, listening to the speeches and generally socialising. Don't let your arrangements get in the way of this. If guests have to move your arrangements to talk to the person on the other side of the table, then you've failed. I like to design arrangements either as low decorations that you can speak over, or tall thin arrangements. 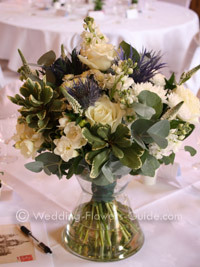 A lot of the brides that I have spoken to recently are choosing the tall arrangements, like the one in the photo above. Take care using strong scented flowers like lilies. I personally love the smell, but some people find it overpowering. You don't want to put anybody off of their food because of the flower fragrance. 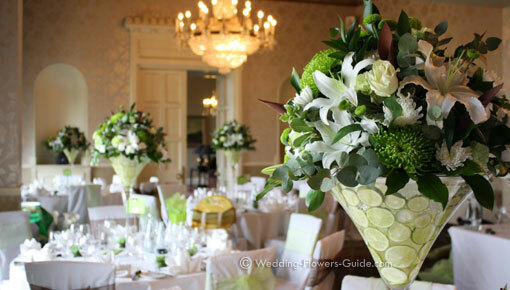 The success of many table centres is because of the vases that were selected, not just the flowers. 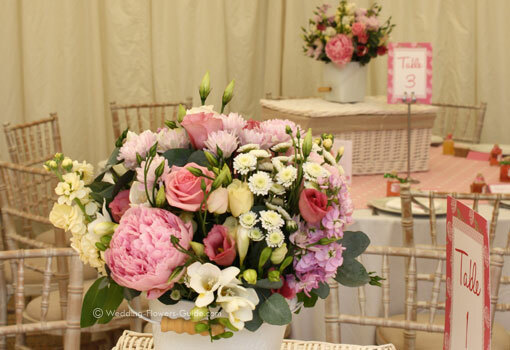 Many florists like us include vase hire in their quotes but check with your particular provider.